Improving your home’s curb appeal can not only make your home more appealing to buyers, but it also can add value to your home. Some curb appeal projects can costs thousands of dollars, like replacing roofing or adding a porch. While those larger projects look great, there are also smaller, less expensive changes you can make to improve your home’s curb appeal. 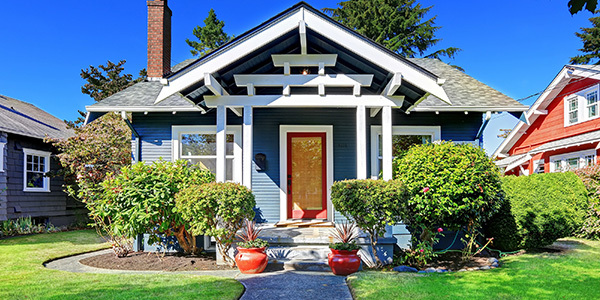 So, whether you are looking to sell your home or just spruce it up, here are our 10 tips to improve your home’s curb appeal on a budget. Think of your door as the focal point of your home. It’s typically what people first see when they arrive. In order to make your home stand out, paint it a fun, vibrant color that complements your home’s color scheme. 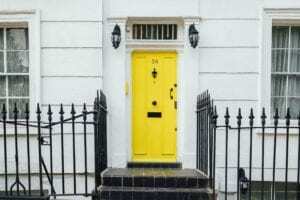 If you’re still looking to add some character or live in a rental that doesn’t allow painting, add a wreath or doormat that shows off your own personal style and improve your curb appeal in a less permanent way. Your home may be beautiful, but old, rusted fixtures will instantly date it. The good news is that you don’t need to spend a ton of money on new fixtures. Instead, sand down any rust, and spray paint fixtures with a more durable, modern finish. You should opt for an “outdoors” spray paint to protect the finish from the elements. 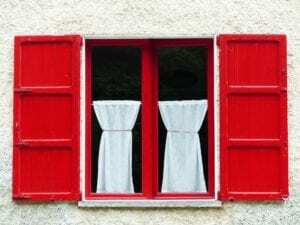 We are psychologically more attracted to symmetry, which means that more people will find your house appealing if its landscaping and features are symmetrical. You can do this by adding lights or plants on both sides of your door and keeping landscaping even. If you want to switch things up, try out the rule of thirds instead. Adding some lighting makes your home attractive at all hours of the day. Placing small lights down your walkway or near landscaping can highlight attractive aspects of your home. Plus, well-lit homes deter intruders and help keep you safe. A bright interior is an attractive feature to potential homebuyers, so avoid planting tall shrubbery or trees in front of windows. 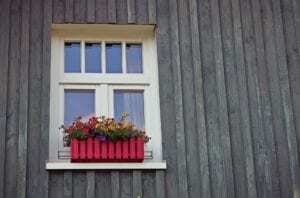 Add window boxes or flowers around your home to give it some dimension and color. When choosing flowers, consider the color scheme of your home and which flowers complement it best. If your home has a warm color, an orange or yellow flower can really stand out. Make sure your flowers bring out the beautiful color of your home instead of detracting from them. Your mailbox may be at the end of your driveway, but it is still an extension of your home’s exterior. Paint it to match your color scheme and plant some complementary flowers around it. If your mailbox post is wooden, make sure to choose a durable paint and apply at least 2 coats. Replace or spray paint any old or rusted house numbers on your mailbox to easily improve curb appeal on a budget. Fake shutters are a great way to add curb appeal to your home. Similar to window boxes, shutters add dimension and depth to your home. If you choose to make them functional, they can help control light and ventilation in your home. Plus, they add privacy and security. Make sure to paint them in a shade that matches the rest of your house. Old, dingy gutters and drain spouts can make your home look dated and neglected. If they are rusted or broken, make sure to replace them with a newer, more durable material. To save money on gutters that are still salvageable, give them a power wash to get rid of any dirt or grime. Notice any cracked or rotting material on the outside of your home? Potential homebuyers will too. Take a lap around your home, notebook in hand. Write down anything you see, no matter how small. Put the big, noticeable things at the top of your list. For smaller items, take an afternoon to tackle them all. A very easy fix to improve you home’s curb appeal is staining or resealing your driveway. It gives the entrance to the home a clean, slick finish and will extend the life of your driveway. Now that you know what to do, it’s time to get started! Do you know any inexpensive curb appeal projects we may have missed? Let us know in the comments!